Sporting Clays: "Golf with a shotgun." "Fastest growing shooting sport in the USA." Open Saturday & Sunday -- September through May 9am to 1pm & weekdays by reservation. 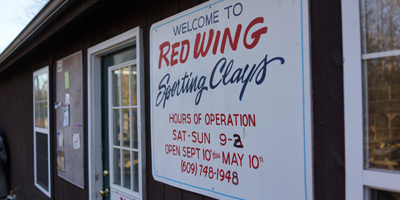 Please arrive by 1pm to begin your round of clays. 2-50 shot sporting clays courses shot over 25 stations. Shooting opportunities for the beginner & competitive shooter. Beginners always welcome. Shooting instructions available. Beautiful wooded course with wood chipped paths and wooded shooting stations and towers. Totally automated course.